Many basic pastry recipes I use, including this one, come from Stephanie Alexander. The sour cream pastry is rich and flaky and can be made in a flash. Put 125 grams flour, cold butter and sour cream in a food processor and blend until pastry has just come together. Wrap in cling film and rest overnight in the fridge. Roll pastry to ½-centimetre thickness and line a 24-centimetre tart shell. Rest for at least one hour — longer if you can. Heat oven to 170C and blind bake* tart shell for 30 minutes or until golden and cooked through. Cover apricots in boiling water. Cream soft butter and sugar until light and fluffy. Beat in eggs one at a time. Fold through almond meal and slivers and remaining flour. Drain water from apricots and cut in half. Stir through almond mixture and spoon into tart shell. Bake for about one hour or until puffed up and golden in the middle. Remove to a cooling rack. Place jam in a saucepan with a dash of water. 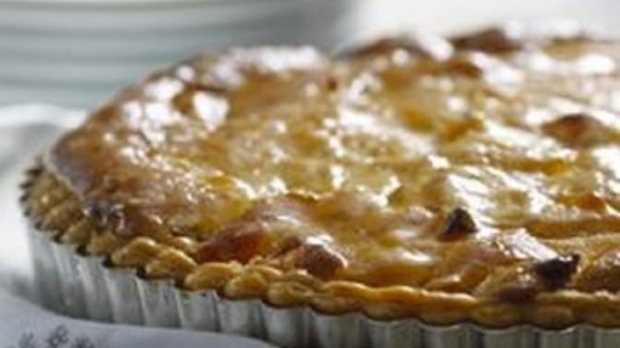 Bring to the boil and brush over top of tart before serving with ice-cream, cream or sweetened sour cream. To blind bake a pastry shell in a tin, pre-heat oven to 170C. Put a double layer of tin foil over the pastry and press into edges and corners. Trim excess foil so it doesn't blow around in the oven (if fan-forced). Fill with pastry weights, rice, lentils or beans so the base is evenly covered. Bake until pastry is almost cooked through, about 25 minutes depending on size of shell. Remove foil and reserve weights for next time. Brush with a beaten egg to seal pastry and bake a further five minutes or until completely cooked through and golden.